8. When Dinosaurs Walked the Earth - Is Genesis History? An examination of an actual ‘bone bed’ reveals unique aspects that could only occur during a global flood. 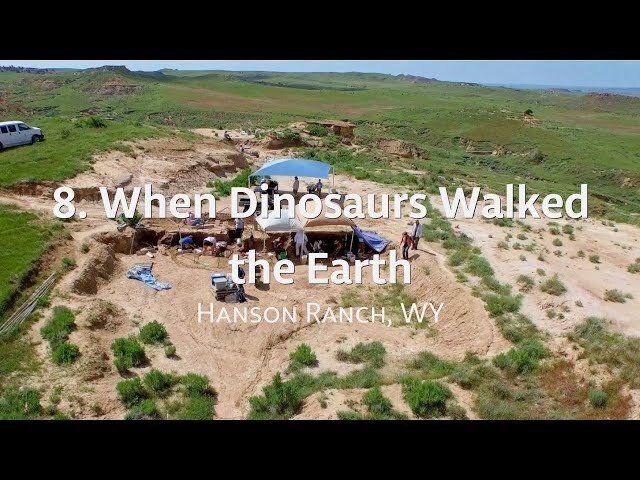 A layer of mudstone 3 to 4 feet thick is spread over a 100 acre area and contains the remains of 5,000 to 10,000 large dinosaurs. Millions of bones are disarticulated (broken apart) yet reveal a unique sorting process at the time of their burial: they are in a graded bed with larger, heavier bones at the bottom and smaller, lighter bones at the top. This unique situation is understood to occur during a catastrophic, rapid emplacement by water. Evidence for these kinds of burials appears throughout the fossil record, with animals suddenly appearing fully-formed, then disappearing from higher layers. A global flood is the best explanation for what we see in the rocks.